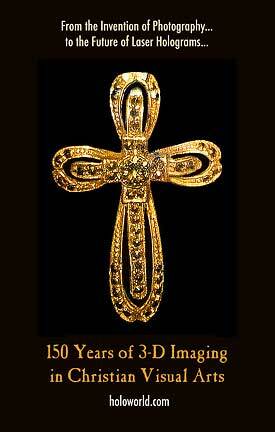 150+ years of Christian 3D imaging science and technology in American pop culture. Close up detail of a diamond cross, 3D laser hologram. The diamonds sparkle, but the cross isn't there. It is made entirely of laser light. Reach for it, and your fingers grasp nothing. 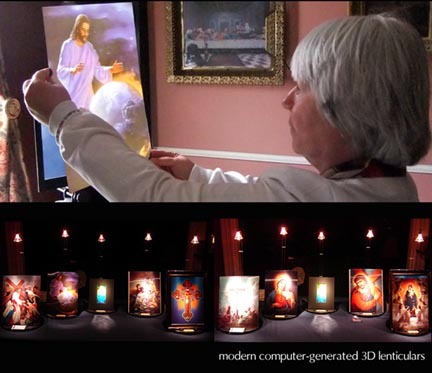 This is an exhibit documenting 150 years of Christian 3D science and technology. 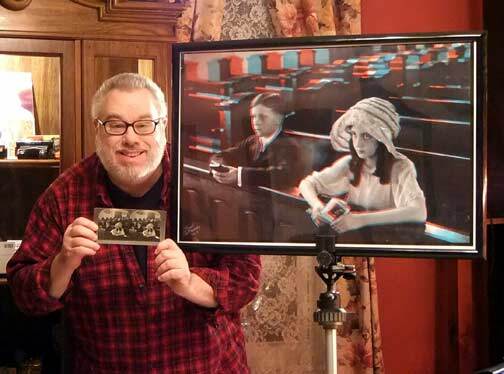 It includes antique stereographs, vintage lenticular prints, up to modern three dimensional laser holograms. 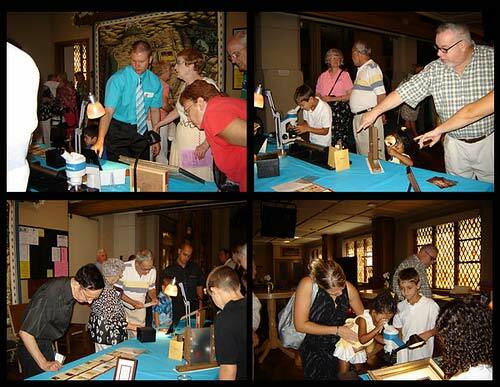 It is curated by Frank DeFreitas, who manages the 20,000+ piece Antiquarian Holographica collection. There is truly no other exhibit (or collection) like it in the world today. *WHY* is there a collection / exhibit of Christian 3D? With the increasing popularity of 3D photography, movies and television, there is a renewed interest in the history of 3D in general. Many people are very surprised to learn that 3D has been with us since the middle of the 1800's(!) *AND* Christian 3D photography, specifically, was the driving force in its acceptance and further development. While one will find an abundance of information online about the history of 3D photography in medical imaging, advertising, movies, etc., there is very little, if any documenting its history in Christianity (as of year 2011 when this web page first went live). *WHEN* did Christian 3D photography begin? 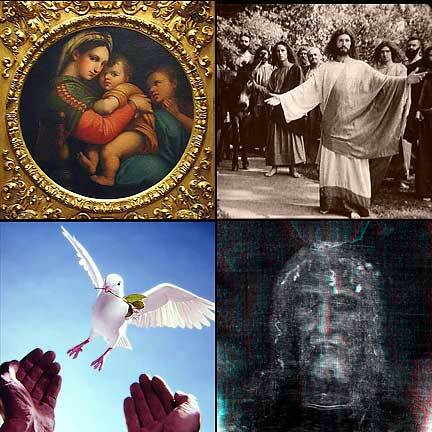 Christian 3D began right along with the earliest stereoscopic photography in the mid 19th century (1850's), with mainly glass plates and French tissue stereoviews. It continued through early stereoview cards (mid 19th through early 20th century), to the printing of mass replicated 3D lenticular images, and film-based imaging (mid 20th century). After seeing somewhat of a lull in production and interest in the latter half of the 20th century, it has emerged once again through today's latest technologies: digital, wide-screen UHD televisions, electronic autostereoscopic hand held devices, and the most futuristic of them all: three-dimensional laser holograms. *HOW* did the collection get started? 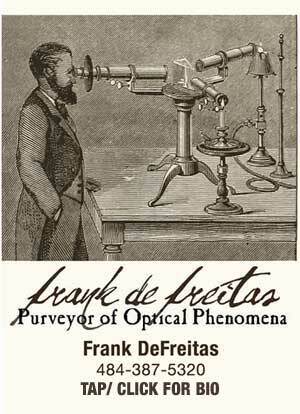 I (Frank DeFreitas) work with, and collect, items related to the history of three-dimensional imaging, particularly the field of holography. My collection is called "Antiquarian Holographica". It contains over 20,000 historical items, and it has taken nearly 50 years to assemble. Both my wife and I work as a team with this aspect of the collection. 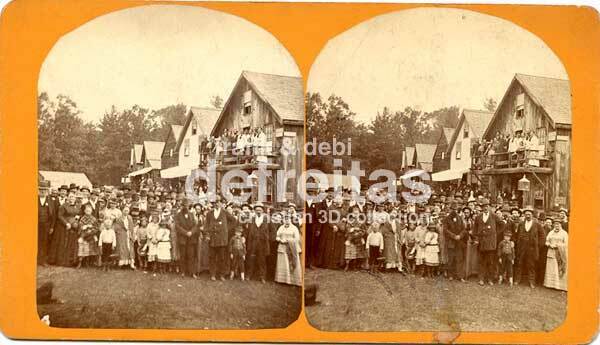 The stereoview card shown above is a selected sample showing the members of New Hampshire's Alton Bay Christian Conference Center. It dates to the late 1800's, and the camp is still there today. My main focus is stereoview cards (or stereographs) showing the history of American evangelism: traveling tent evangelists, camp meetings, and various other early Christian gatherings. Unlike the limitations of traditional photography, with stereoscopy the cards permitted these events to be documented in their full 3D splendor. 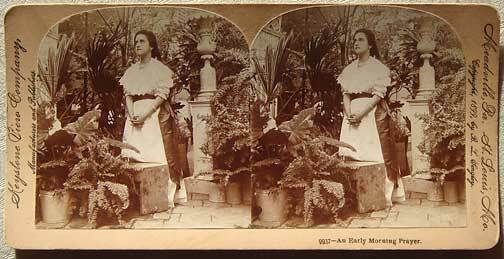 They were typically viewed in a stereoscope, the darling of the 19th century well-to-do. The most sought after (and valued) are those view cards in which the imagery was captured by independent stereo photographers. These could be produced in very small numbers for groups, or in some instances be a one of a kind view. This would not have been an inexpensive hobby for an amateur photographer of the day. Stereo photography was imaging science and technology at its highest form. This was the new frontier. In addition to the standard view cards, there are also those on gelatin silver glass plates, and hand-colored French tissue. Not many of these fragile stereo views have made it to the 21st century. Additional paper-based imagery includes stereo postcards. All of these made their way to the American shore in the latter half of the 19th century. The collection also consists of various antique stereoscopes, with manufacturing dates ranging from the 1860's through the latter half of the 20th century. They run from beautiful wooden stereoscopes imported in to the USA from France, to the various View Master models, to molded plastic kids viewers. All with the theme of the life of Jesus Christ. My latest project is to scan, hand-restore and convert these into digital 3DHD files for large-screen HD televisions ... where the people and places of American Christianity's heritage really come to life for the viewer. My current activity is working with a Fuji Real 3D V3 autostereoscopic digital 3D photo frame. A stereoscope viewer creates a 3-D effect by using a card, reel or film with two side-by-side images that become one 3-D image when viewed through the glasses of the viewer. 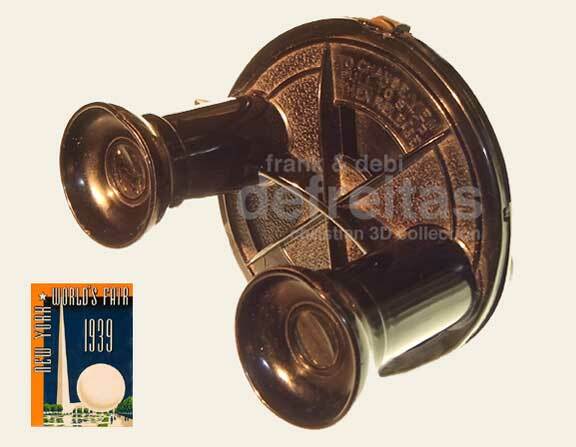 The above View-Master stereoscope is one of the very first units offered for sale at the 1939 New York World's Fair. 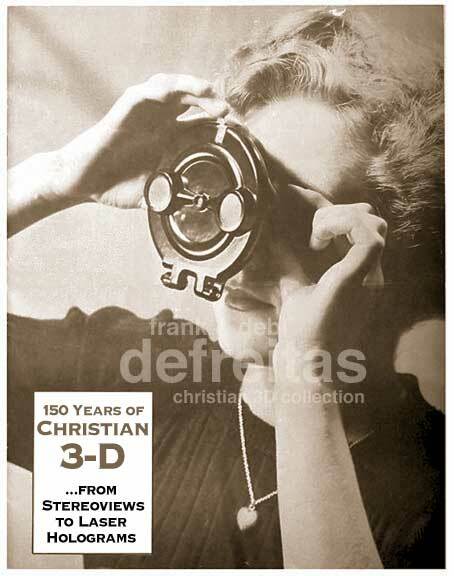 It is one of many such stereoscopes in our Christian 3D collection. Entire web sites can be devoted to the View-Master, and there are many online. To add yet another seemed silly, until I realized that no other web site approaches the View-Master from the subject of Christianity. This is surprising, since View-Master (among several others) devoted many of their reels to the subject. Therefore, these 20th century stereoscopes and their reels, cards and filmstrips are a big part of the collection. The various companies brought Christian 3D to American pop culture in a big way: from rural, to inner city, to the new suburban American homesteads. Every Christian based 3D motion picture that you watch today, whether in the movie theater or at home, has these family-affordable viewers to thank. They started it all. Other branded stereoscopes that are represented in the collection are Tru-Vue; Stereo Realist; TDC; Stori Viewer, Radex, 3D Picture Viewer, Jules Richard and others. The 3D anaglyph has become to be known as the low-end of 3D technologies. At one time it was found most often in print publications such as comic books and magazines, both of which were quickly produced for mass consumption on low grade stock. These are the type of 3D that require wearing red / cyan colored 3D glasses. The image above was shot by a famous lenticular artist / technician, Victor Anderson. 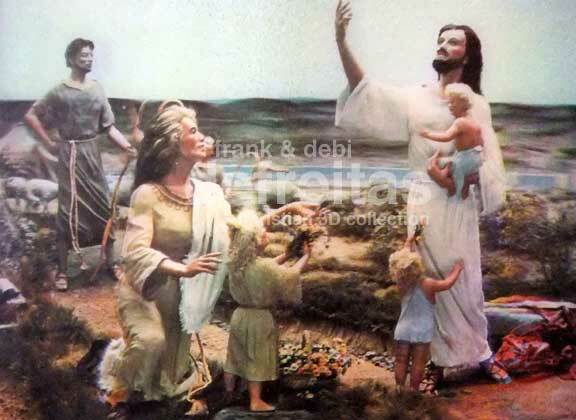 He made a series of lenticulars of Christian dioramas created by artist / sculptor Paul Cunningham. They were located at the Prince of Peace Museum in Gettysburg, Pennsylvania, and the Prince of Peace Memorial in Silver Springs, FL (both long closed now). While there are scores of postcards commemorating both of these establishments, each is only a standard 2-dimensional photograph. With the lenticulars, the 3D dioramas live on, being as close to the "real thing" as one can get. Lenticulars have a diamond-cut screen overlay that sends the right eye image to your right eye, and the left eye image to your left eye. Your brain then puts the images together again, and sees the scene in 3D. If done properly, they can be very impressive, indeed. Many times lenticulars will have many more than just two viewpoints, in comparison to stereoview cards. Some of the more professional cameras would record up to eight or more perspectives, which would allow for quite a bit of parallax to the final image. The more perspectives, the greater need for accuracy with image registration. In some modern instances, it is quite possible to "look around" objects, very similar to the experience of viewing a hologram (which is an entirely different process altogether). I am a holographer. 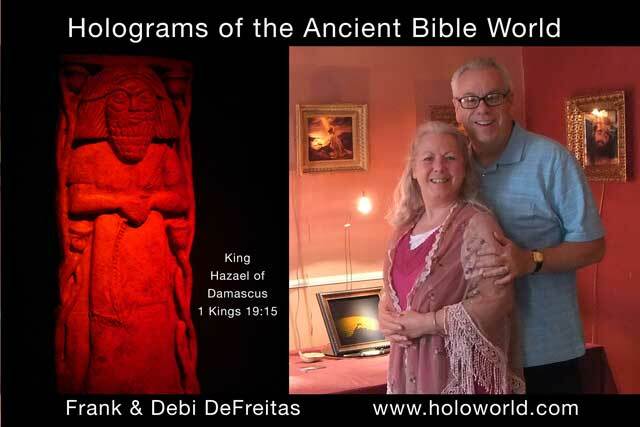 The above photo shows a small test hologram which contains the holographic image of the King Hazael stele. At this stage of the project, I am working with museum replicas exclusively. It is as if the object were physically behind the glass. This can allow priceless artifacts to be displayed as if they were really there in the exhibit. But the objects are not there at all. They're holograms. The resulting holographic image will record the exact optical wavefront of light that the object will reflect, including phase information. Therefore, upon reconstruction with light, it will appear once again in three-dimensional space as if it were sitting wherever the hologram is shown. These artifact holograms can be made in multiple copies of any number, and sent around the world to other research facilities. 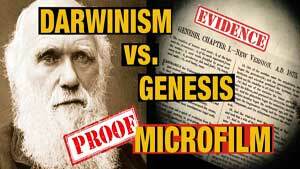 In fact, if placed under a microscope, the holographic image acts as if the real object is present. Resolution is so fine that the microscope -- if powerful enough -- can zoom in on, and resolve, detail as small as surface bacteria. That is quite a recording process! The above photo shows a very rare 4 x 5-inch Kodachrome positive transparency for the cover art production of View-Master's famous Christmas story. In this section I will be presenting all of the various Christian based reels, filmstrips and film cards from manufacturers. In the upcoming ephemera section, I'll also showcase associated production files, which contain scripts, notes, original art work, layouts, typography, CMYK color separations, etcetra. Other reel, filmstrip and film card manufacturers were Tru-Vue; Stori Viewer, Radex, 3D Picture Viewer, and others. The Christian 3D collection deals mostly with the end result of 3D cameras. However, I still maintain a small collection of these items ... just to show the history and science and technology development along the way. Of course, I'm speaking of 3D cameras, 3D projectors, digital 3D-HD cinema, and the new digital autostereoscopic screens. These pieces of equipment would have been used to document everyday Christian living, particularly in mid- 20th century American culture. Church events, weddings, christenings and baptisms, and so forth. While many, many of these photos exist in 2D, they are relatively rare in 3D, and as 3D kodachrome slides, are usually much higher quality than any of the surviving photos! The Fuji Real 3D V3 photo frame is autostereoscopic, which means that viewers do not need to wear 3D glasses anymore. All you need to do is look at the screen and you see the full 3D effect (assuming that the photo is a 3D photo, of course). I have been scanning, restoring and digitally converting many of my 19th century Christian 3D stereoviews to this format and they are quite extraordinary. It is very exciting to be a part of moving these early 3-dimensional images into the 21st century (and beyond). 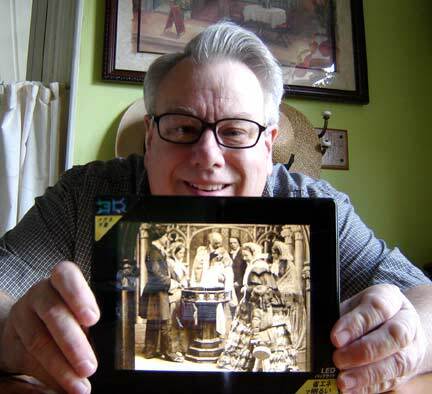 Here (photo above) I'm shown displaying the first test shot of this project played back on the Fuji Real 3D V3 autostereoscopic (no glasses) viewer (23 SEPT 2014). It is a beautiful 3D image, and the screen is LED and true lenticular. The restored and digitized 3D image (shown zoomed in) is from an 1850's stereoview card and shows an infant baptism being performed in England, with credit going to Burfield & Rough, 180, Strand, Corner of Norfolk Street, London. Glasses are not required to view this image in 3D, providing that you are at the screen (it does not appear 3D as a web page photo). This is the test shot that will lead to large-format cinema 3D images. Unfortunately, since the 3D digital screen is imported from Japan, all of the on-screen menu options, and the instruction manual are in Japanese only. Therefore, at the moment, I am somewhat limited in my ability to fully utilize all the features. Ephemera is the largest holding of the 20,000+ piece Antiquarian Holographica collection. 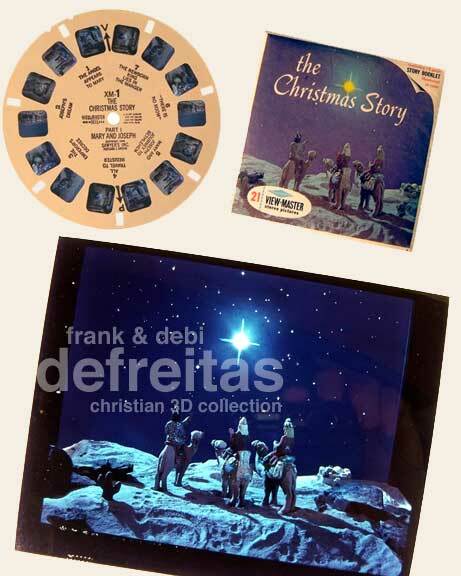 The Christian sub-category covers various paper based items associated with the stereoscopes, reels, filmstrips, film cards, lenticulars, anaglyphs, holograms. One can find advertising, posters, postcards, books, letters, documents, first day envelopes, stamps, booklets, boxes, and so on. These items are not the actual reels et al themselves, but items that would be supplemental to them. Most would be considered throw aways, such as instruction sheets, receipts of sale, antique company stock certificates, and more. Ephemera was my first love, and Ephemera was the category that started it all 45 years ago. The first item was the exhibit booklet from the Museum of Holography traveling show "Through the Looking Glass" held at the Walnut Street Theater in Philadelphia, PA (1975?). Many other Christian-based items in the collection date back well over 150 years. Every piece of the collection is an original, not a reproduction. Some pieces are held in highly esteemed historical archives such as the Library of Congress, and the George Eastman House Library Archive. Have a presentation with Frank at your church, school or home school group. Thanks for visiting!